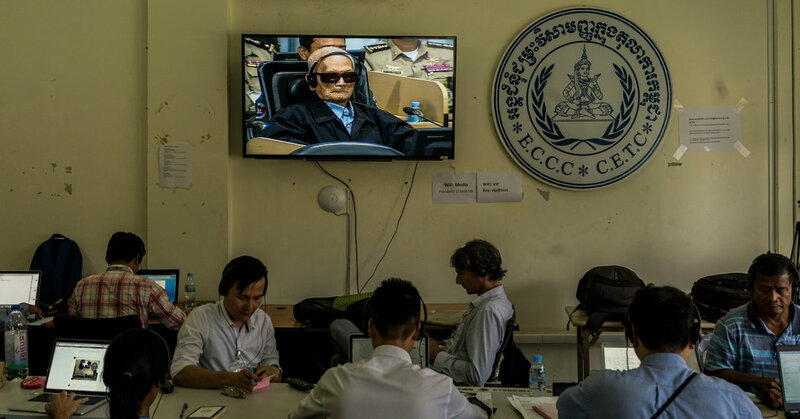 PHNOM PENH, Cambodia — Barely a month after an international tribunal in Cambodia convicted two senior Khmer Rouge leaders of genocide, its historic verdict was being thrown into question by an unexpected twist: an unlicensed lawyer. The lawyer, Victor Koppe, has worked as defense counsel since 2007 for one of the convicted men, Nuon Chea. His client, now 92, was sentenced to life imprisonment by the international tribunal last month. But Mr. Koppe was dismissed by the tribunal this past week after the bar association in Cambodia said that Mr. Koppe, a Dutch national, had not been a member of the bar in the Netherlands for nearly three years. Without his foreign registration, Mr. Koppe could not be licensed as a lawyer in Cambodia, the bar association said. It remained unclear what effect, if any, this development would have on the genocide ruling, which is now in the appeals stage. The verdict came four decades after at least 1.7 million people — a fifth of Cambodia’s population — lost their lives under the Khmer Rouge. Neth Pheaktra, a spokesman for the tribunal, said that neither the tribunal nor the Cambodian bar association had known of Mr. Koppe’s status until this month. Suon Visal, the head of the Cambodian bar association, said Mr. Koppe was disbarred in Cambodia as early as August when the association learned that his membership in the Amsterdam Bar Association had lapsed in 2016. Mr. Suon Visal said in an email that Mr. Koppe was “disqualified to be lawyer at ECCC and violated lawyer’s code of ethics.” He accused Mr. Koppe of judicial malpractice for appearing in court after he was disbarred. This development underscored the complications that could arise in a legal process that is effectively an experimental hybrid of local and international legal systems. In the tribunal, known as the Extraordinary Chambers in the Courts of Cambodia, each defendant has both local and foreign lawyers who must be members of the bar in their home country and registered with the Cambodian bar association. Critics have said the dual structure of the tribunal creates inefficiencies and puts the court in thrall to Cambodia’s notoriously corrupt judicial system. The genocide verdict on Nov. 16 was a rare bright spot for an institution that has received a steady drumbeat of bad press over its slow pace, limited scope, and susceptibility to corruption and political interference. As Mr. Nuon Chea’s lawyer, Mr. Koppe was known for his vigorous defense tactics and his criticism of the workings of the United Nations-backed tribunal. Mr. Koppe could not be reached for comment. Michael Karnavas, a lawyer who has represented two other former Khmer Rouge leaders, said Mr. Koppe’s lapsed legal qualification in the Netherlands had been widely known in the legal community at the tribunal since 2016. That year, after Mr. Koppe publicly criticized a judge, the tribunal tried to complain to the Amsterdam Bar Association and found in the process that his membership had lapsed, Mr. Karnavas said. “In Victor Koppe’s case, he was effectively practicing without a license,” Mr. Karnavas said. A spokesman for the tribunal did not immediately respond to requests for comment.